This Idea came about because I had a flat tire. Per Murphy's Law, 90% of the time when you get a flat tire, it's the rear wheel, more difficult to fix than the front wheel. It occurred to me that the actual statistic might have nothing to do with Murphy's Law, and instead be related to the distribution of weight, between the wheels, of the average bicycle. The seat is so close to the back that possibly 70% of your weight gets carried by the rear wheel, making it easier for puncturers to puncture that wheel. So I was walking home alongside my bike, thinking that if only I could sit over the front wheel, I could maybe ride the bike home. See, as it was, the bike's own weight was mostly being carried by the rear wheel, and if I could concentrate my weight over the front wheel, only a little more would be added to the stress on the flat tire. Normally if you ride around on a flat tire, it can get severely damaged, but that's because normally most of your weight is right there on it. Well, I'm sure you know that kids have been occasionally seen sitting on bike handlebars while the main riders pedal away. Some bikes even have front-wheel foot-rests to make this easier/safer! Why not mount an actual bike seat there? It would certainly be more comfortable! So, with such a seat you would indeed be able to put most of your weight over the front wheel, if the rear tire went flat. But how to pedal? You might be able to reach the normal pedals if you sat facing rearward, but that's not a very smart way to ride a bike in the ordinary direction! Well, anyone who's ever ridden a kid's tricycle knows that it's possible to put pedals on the front wheel. That would solve the second problem just fine, and you could ride the bike home. Somewhat slowly, though, which counts as a third problem. Let's suppose the rear tire is NOT flat, and you invite a friend to ride with you on this bike. As you pump the normal pedals at some normal speed, the friend will not be able to keep up with the rotation speed of the front pedals! In the late 1800s it was popular to build bicycles with REALLY BIG front wheels, with pedals, too. The rationale had to do with the simple fact that that one pedal-rotation can only take you a distance equal to the circumference of the wheel. If you want to go fast, you need a big wheel. Today's ordinary bicycles can't easily accommodate large front wheels, and especially so if you want someone to ride with you on the handlebar seat. What we need is something equivalent to the sprockets and drive chains that drive the rear wheel; we need a decent gear ratio. This can be done fairly easily! A type of bike you don't see much any more was a 3-speed, even though it only had 1 front sprocket and 1 rear sprocket. Inside the rear wheel hub was a set of gears that could be controlled via a selection-cable in different ways, to provide those 3 different speeds. Obviously, we need something like that for the front wheel pedals! We don't really need more than one gear-ratio inside the hub, though (and a selection wire would likely get in the way of various things). We just need to make sure that someone pedaling from the handlebar seat doesn't have to pedal insanely fast, to keep up with the person using the ordinary pedals. To make the pedals co-axial with the wheel, you need a special hub that has two pairs of bearings: one pair to support the wheel and one to support the pedal axle. The stock hub that you refer to won't cut it. If you make such a hub (they are not available TMK), you could arrange the transmission through a countershaft that is parallel to the hub axis. Attached to the fork crown for example. A normal chainring on the pedal crank, chain to a sprocket on the c-shaft, another chain down from the c-shaft to a sprocket on the hub. Sounds clunky but all the parts are simple, and there's plenty of places to put a sprocket cluster(s) for multiple gears. I had considered a transmission of this kind (co-axial pedals & hub) for a multispeed unicycle or various designs of recumbent bike. Since it remains unbuilt, the HB gets to chew it up. The main idea was baked by a kid on the first year of "Greatest American Inventor" TV show. He didn't hae gearing though. Yep, and I thought he should have won too. That was a pretty cool bike he came up with. [iron horse], yes, I was aware that the standard 3-speed hub could not be used as-is, so I wrote "something like that" (mostly because it was late and I just didn't want to put more time staying awake writing those details). Thanks for your description. To the others, I hadn't seen the TV show; this was independently dreamed up. I'm not surprised, though I WAS kind-of surprised not to have seen either part of the main Idea here already at the HalfBakery. Yeah, that kid should have won and hey this is a good idea that you thought of, just a little late. I do that all the time and just try to think fast enough to get ahead. My only problem with this was the panic braking causing rider ejection issue of having that much weight up front. The upside is that the front rider could land on his feet, the normal rider will probably eat pavement. [+]. However an easier way of doing this might be to have a handlebar seat and front-wheel hub motor. It would be easy enough to design a small epicyclic gearbox (like the old Sturmey-Archer 3 speed) that fitted in the front hub .... the idea is perfectly practical. 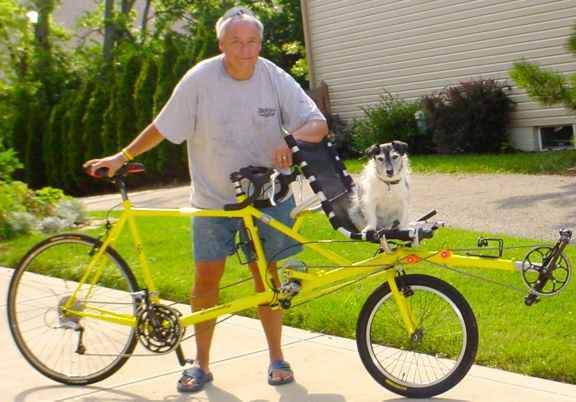 But is this a single person get-you-home idea, or a back-to-front tandem ? [8th of 7], the Idea was written as a solution to a problem; it just has a side-effect that makes it useful for more than that only. Also, the rider's weight is somewhat behind the front wheel on a penny-farthing, whereas this idea is (partly) about getting the weight mostly over the front wheel. My penny-farthing riding friend reckons that brakes are nearly useless, and that the only safe way is to use the legs to slow down (they have fixed pedals, of course). May also apply to this idea, at least when used in single-rider-on-handlebars mode. not so sure about your logic there. I suspect that the incidental loading of hard braking would overload the front tire.